A look at the plethora of things one can hang on a wall and some easy guidelines to make the most of your space. So what all can you hang on a wall? Literally anything, as long as it’s true to who you are and to your style. I love a good Windberg landscape! So much room to play here. My mom has an entire wall of nothing but crosses. Metal, wood, painted, different shapes, sizes, colors, designs, textures, some even have sayings. Have it on wood, etched into metal, painted on a canvas, have it as individual letters painted and designed. I’ve seen so many designs, from Bohemian to straight-line modern. You can get them in any color or colors, big or small. They’re made out of sticks, barbed wire, vine, metal rods, wooden rods, hoops, and so much more. Some are adorned with flowers, foliage, beads, feathers, etc. There’s one out there for you! Quilts are works of art themselves. Find an antique one that fits your living room, or better yet, make one yourself to put on the wall. Then when you get tired of it, use it! This is a great way to hang on to a family heirloom quilt, as well. Open shelving is great for storage and adding interest to a wall, while still keeping an open space. You can also find a small antique shelf to float off the ground. It’s pretty, interesting, and functional. When this is done well, I think it’s super, super cool! I wouldn’t do it personally, but I have a huge respect for those who respect old school music. See my post about decorating with skulls! Only if you actually killed it. If not, then don’t. Not antique frames, not antique quilts. I mean things. Windmill blade, bicycle, 1954 hubcap or front bumper, antique wrought iron archway. Something that just doesn’t belong on a wall, but looks damn good being there anyway. Windows are fun! It’s neat seeing a window pane where there isn’t actually a window. You can paint the trim to contrast with the color of your walls, tie in with other hints in your space, or make them white to add freshness and openness to the space. You can even put windows over a basic wall hanging, like a simple still life, as a way to frame your favorite artwork, while creating texture around the room. You can find endless tips, graphs, charts, lists, and write-ups about the “right” way to hang things on the wall. I personally don’t have time or the desire to deal with ratios, measurements, and rules. No thanks. So to be helpful, but also not obnoxious, I narrowed all my research and experimentation down to 4.5 simple tips to help guide you. Try to hang the focal point of your piece at a normal person’s eye-level. Not exactly at eye level. For instance, if you’re hanging something above your TV, it’s going to be slightly higher than eye-level (because the TV is presumably at eye-level), but should be in a position that allows the eye to travel naturally upward from the TV to the hanging. You just don’t want someone to crane their neck just to see what you’ve got going on. You also don’t want it hidden behind furniture or low that someone would have to bend down to see it. It needs to be a focal point in your room, something to tie everything together, and make it blatantly obvious to anyone that walks in that this is who you are. 2. If you’re creating a collage, keep it within a confined space, set by furniture and room lines. This kind of goes with keeping things at eye-level. You don’t want your wall-hanging and aren’t to be in funky places that are inconvenient for an onlooker. I personally love collages, so when I do them, I like to keep them centered. Reigned in. So for example, if you have your couch against a wall between two doorways, only hang stuff above the couch, between the boundaries set by the arms of the couch, and lower than the tops of the door frames. It looks controlled and gives the room a natural flow and order. As for how you arrange your wall-hangings within your space, that’s all up to you! Notice how everything hung is within the boundaries set by the couch and also aren’t too high up on the wall. 2.5. I personally think collages or a diverse mix of wall-hangings is the way to go. 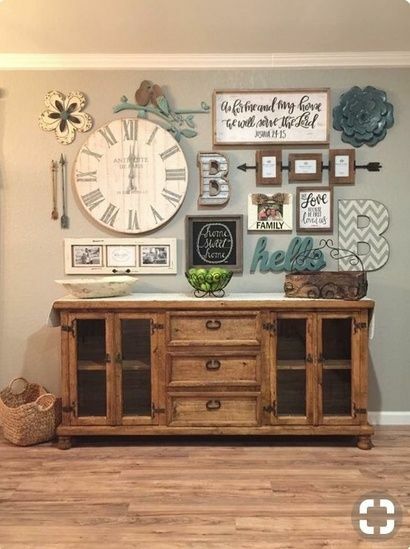 Hang a window above the left side of the couch, above that hang a long wooden sign with a quote or word on it, hang an antique rake down the center vertically, and a mix of family photos on the right hand side with another wooden quote going horizontally beneath them. Just mix it up! Hang a mix of paintings, quotes, and shapes of all sizes with a corresponding color scheme. Hang a clock, rusted windmill, and a skull altogether. Whatever makes the space you. Here are some of my favorites that I’ve seen on Pinterest. 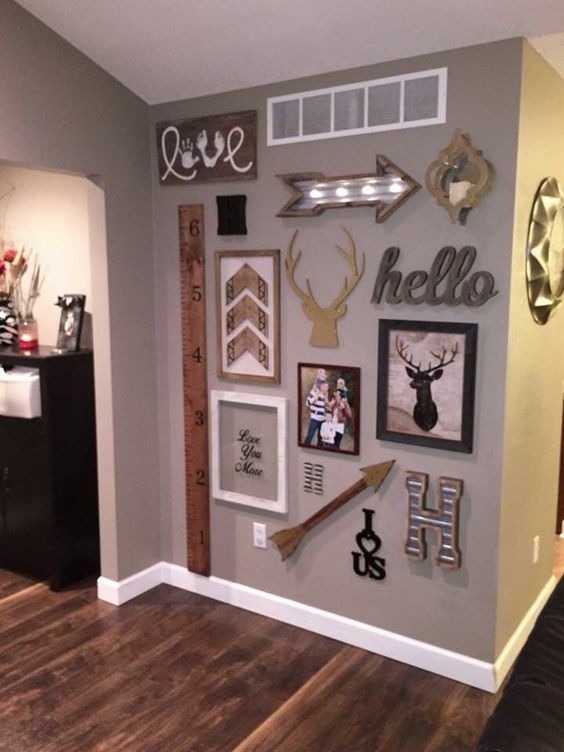 3) Use an entire wall to hang things on. This sounds contradictory to number 2, where I say stick to a set space, but in this case, a smaller wall is the space. Think of it as putting a 3D wallpaper up. 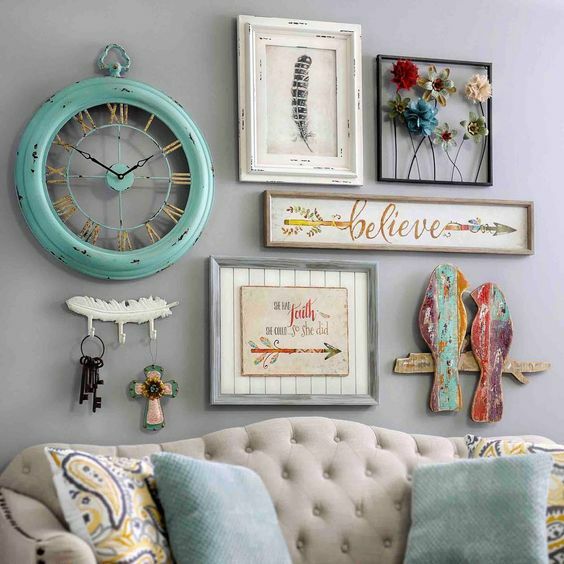 Mix and match different kinds of wall hangings to create a theme. 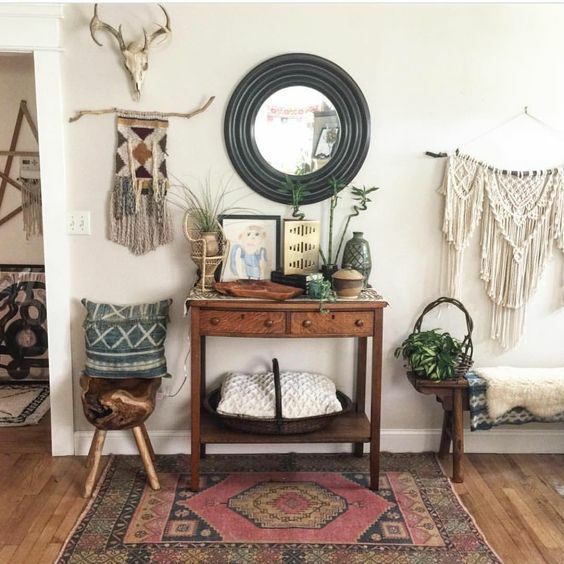 Don’t think you have to put certain things on the wall or you have to have one of those funky eclectic walls with random arrows and art pieces and quotes that look Instagram-ready. This is your wall, and it needs to scream that. These tips aren’t to tell you how to decorate your house, but rather give you guidance when doing so. I hope this guide has helped your decision-making go a little smoother and given you some inspiration as to what you can do with your walls.